Turtle Back Zoo’s newest indoor exhibit, “Shores of Africa” recreates the South African coast line where these birds are found. Home to a flock of endangered African Penguins, the zoo participates in the penguin species survival plan (SSP) breeding program. In the new exhibit you will see an incubation room where Keeper Staff can help rear these threatened populations. 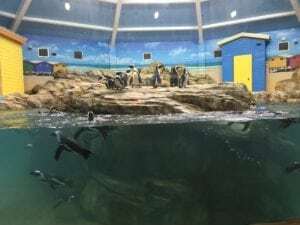 Three viewing stations let you experience our penguins from land to fully underwater. Penguins are birds, but they don’t fly; at least not in the air. They appear to be flying underwater, however. Come see for yourself how they swim, dive, and turn with lightning speed. Their superb swimming skills rival that of the seals and porpoises. No! African is not a misprint. This is now the official name for the black footed penguin, also known as the jackass penguin, that lives on the rocky shores and in the water around southwest Africa. There are seventeen recognized species of penguins, all living in the Southern Hemisphere. Most occupy the ocean and islands around the Antarctic ice pack to the land masses of Southern South America, Southern Africa, Australia and New Zealand. Only two species spend most of their time on Antarctica. These are the Emperor and the Adelie. The most northern species is the Galapagos penguin that lives in the waters around the Galapagos Islands.